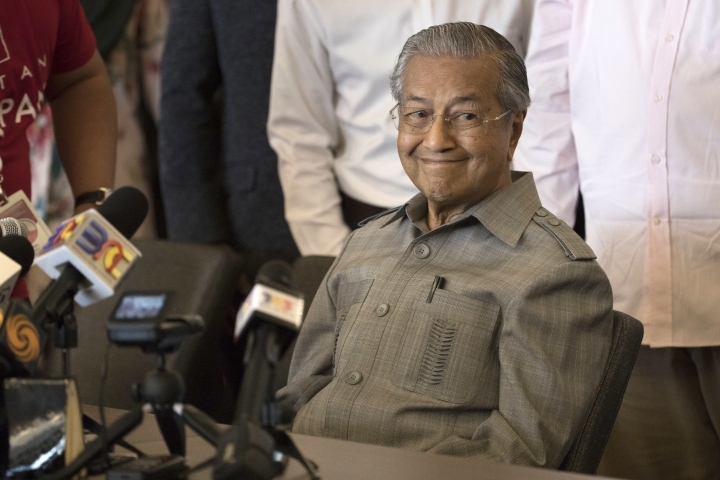 KUALA LUMPUR, Malaysia — The election victory of opposition parties led by Malaysia's former authoritarian leader Mahathir Mohamad has raised uncertainty for the economy and for big projects linked to China's regional infrastructure initiative. However, analysts said Thursday that Mahathir's strong track record in handling the Asian financial crisis of two decades ago could put the economy on a more stable path in the long run if he delivers on pledges to clean up a legacy of corruption fostered during an earlier, authoritarian stint as prime minister. Malaysia's currency, the ringgit, dipped soon after the election results were known. By late Thursday a dollar could buy 3.95 ringgit, down about 2.4 percent from before the vote. The impact of the election results on local share markets won't be seen until they reopen on Monday. The end to the National Front's 60-year hold on power brings on a new era of uncertainty, the credit ratings agency Moody's said in a statement. "Little is known about the opposition's full range of economic policies, and its electoral pledges have lacked details that would allow for a full assessment of their budgetary and macroeconomic impact," it said. 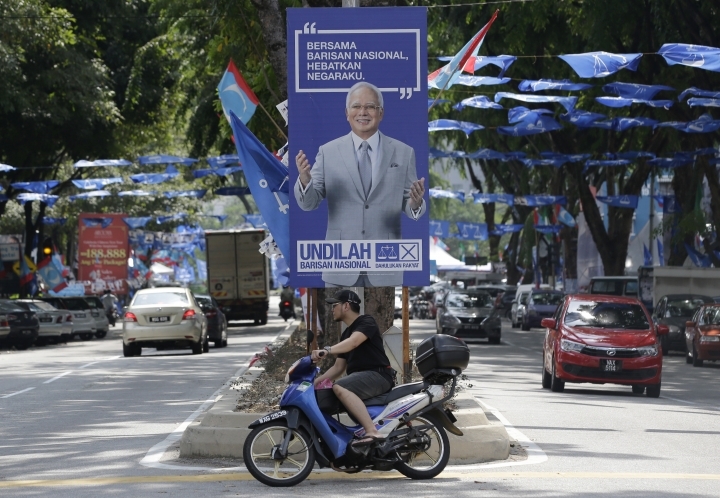 The opposition coalition triumphed by tapping into public anger in Muslim-majority Malaysia over a corruption scandal and over a tax imposed in 2015 that fell especially heavily on the rural poor. On the eve of Wednesday's polling, perhaps to stave off any panic in the markets, Mahathir's Alliance of Hope issued a statement saying it was committed to "responsible and progressive fiscal reforms" in an orderly, transparent and systematic manner. Mahathir told a news conference on Thursday that his administration would keep its campaign promise to cancel the 6 percent goods and services tax. Defeated Prime Minister Najib Razak left the country in a "mess," he said. Mahathir said major public projects will be reviewed, government procurement done by open tender and state-owned enterprises made more publicly accountable. He promised to draw up a comprehensive reform plan by the end of his first 100 days in office. The new government also intends to review Chinese projects in the country, reserving the right to renegotiate the terms of loans used to finance them — a sticking point with a growing number of countries contending with rising debt from Beijing's "Belt and Road" initiative aimed at expanding Beijing's influence and linking China more closely to regional markets. Chinese investment is welcome, Mahathir has said, but only if it creates jobs and brings technology and capital into Malaysia. After six decades of rule by the National Front, which he once led himself during 22 years in office before stepping down in 2003, Mahathir faces a challenge in rooting out corruption. The lack of strong checks and balances to ensure a "rule of law" are largely a legacy of his own strong-arm tactics decades earlier, risk assessment consultancy Verisk Maplecroft said in a research note. Mahathir's credibility as a corruption fighter may hinge on how he handles the 1MDB investment fund scandal that helped bring down Najib and was a major factor behind 92-year-old Mahathir's emergence from retirement to challenge him in alliance with opposition groups. The United States and several other countries are investigating allegations of cross-border embezzlement and money laundering at 1MDB, which Najib set up to promote economic development. It accumulated billions in debt. The U.S. Justice Department says $4.5 billion was looted from state investment fund 1MBD by associates of Najib between 2009 and 2014, including $700 million that landed in Najib's bank account and a $23 million pink diamond necklace bought for Najib's wife. He has denied wrongdoing. As for his track record, Mahathir has been credited with transforming Malaysia from a Southeast Asian backwater into a modern economy. Though he later admitted that he had unfairly blamed U.S. financier George Soros for the currency speculation that helped bring on a regional financial crisis in 1997, his insistence on controlling the value of the ringgit and refusing to seek funding from the International Monetary Fund was vindicated as Malaysia's economy recovered. "Malaysia's economic policies during the East Asian crisis later won widespread acclaim from many other developing countries," Rajiv Biswas, Asia Pacific chief economist at IHS Markit, said in a commentary. The reforms that followed "considerably strengthened the Malaysian financial sector," he said. Malaysia remains heavily dependent on exports of both commodities and manufactured goods and is one of the most open economies in the world, with about 40 percent of jobs linked to exports, according to the World Bank. Asia business editor Elaine Kurtenbach contributed from Bangkok.